The only way I am going to be productive, I've decided, is get to bed early and get up early before everyone else, and do things like blog entries first thing. 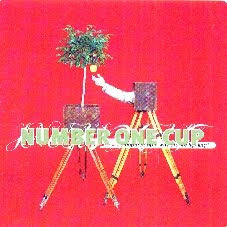 A few days ago, I woke up with a song by Number One Cup in my head. And I'm not completely sure why that happened. They were a Chicago band in the 1990s who put out a few pretty good albums and one amazing, should've-been-on-every-smart-critic's-year-end list album before breaking up. I came across them when a guy put their song "Dive Bomb" on a tape for me. It was sort of a Pavement-y, catchy simple sound with the hook coming from the way they used a keyboard with one of those whammy bars to bend the pitch. And they used it on every chorus to simulate the dive bomb effect. Since the sound was more whiney than catastrophic, it was pretty funny and made me think these guys have something going for themselves. In 1999, I bought Number One Cup's album People People Why are We Fighting? which is a pretty brilliant album name (coming from Mick Jagger's comment at Altamont after the stabbing). I always forget it came out a year earlier and I always want to put it on my "Last great albums of the millennium" list, beside Olivia Tremor Control's Black Foliage (which never seems to get its due) and Neutral Milk Hotel's In an Aeroplane Over the Sea (which does). It was a purchase based on what I read on a press release about the band and it ended up being a smart buy. Their first two albums were mixed bags (as I'd find out when I worked my way backwards in the discography), but People really comes off as a strong diverse album. The songs all sound pretty different but they work together to create a complete project. Three out of the four guys take turns singing lead. Drummer Michael Lenzi, who does a lot of it, has a voice like a cross between Big Dipper's Bill Goffrier and the Cure's Robert Smith. He sounds really tense on some songs which goes along with the loud power chords and simple but perfect one string leads ("Low Sparks"). After he gets you all riled up, Patrick O'Connell shifts vocal gears and calms things down (in "Ice Melts Around My Battery," for example). "Canada Disappears" is a two-minute piece that quietly rises up at the end of the first half of the album (I don't know if it appeared on vinyl, but this was the logical place for Side One to end). Later on, "Caught on the Crown," another soft, piano driven piece, emerges out of an extended coda of metallic noodling in the previous song, all low-register, haunting minor key vocals, providing a good contrast to the high vocals and counter melodies you just heard. The title track is a six-minute sound sculpture, for lack of a better word that begins with a rainstorm and piano meanderings and climaxes with some really loud sounds from a noise generator. I think what put Number One Cup in my subconscious had to do with "Remote Control," my favorite song on the album. In it, Patrick sings in Michael's register over a simple three chord riff that gets overlaid with "doo doo doo" harmonies, a great countermelody and a vague lyric that could be the thoughts of a spy. (It has the "metallic noodling" coda mentioned above.) This is one of those times that proves how simplicity can be irresistible if it has the right amount of enthusiasm behind it. I've always had this song figured as a cover and I'm in a new band that has a show coming up and our set is still coming together. So maybe I was thinking in my sleep that we should learn "Remote Control." On September, 10, 2001 I wrote the band a letter which was returned a few weeks later. I tracked them down via email a little while later. They had disbanded by then, with some moving on to another band, Fire Show was the name. Flydaddy Records released People People and they went under a few years later. So finding the album is probably impossible now. But it's worth the search. And if you see it on vinyl, somewhere let me know. PS In searching for an image of the album cover I came across this, http://www.magnetmagazine.com/2009/02/24/lost-classics-number-one-cups-wrecked-by-lions/ a rather back-handed after-the-fact shoutout to the band's second album, followed by a comment from Seth Kim-Cohen from the band. It's Saturday night and I........... am falling forward at the computer. I have things to say but I'll tell you more later. 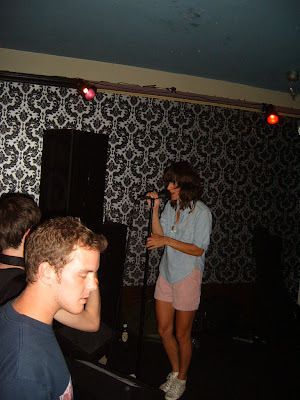 In the meantime, go to http://www.blurt-online.com/concert_reviews/view/183/ and read my review of the Fiery Furnaces show in Pittsburgh a few weeks ago. Blurt put it up this past week. Since they didn't run my pictures of the Friedbergers, here's an exclusive for you. It's hard to think of Miles Davis and Sonny Rollins as just another couple of guys (cats, as it were) working on finding their own unique voices in a still developing genre of music. But in 1951, that's not too far removed from how they were on the earliest of these recordings. Continuing to mark the 60th anniversary of Prestige Records, Concord Music - who now owns the label that Bob Weinstock started - has compiled the 25 tracks that these giants-in-the-making recorded together over a period of five years. 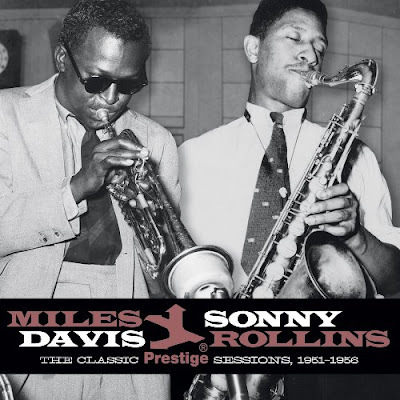 Granted Davis and Rollins were at the head of their classes on tenor and trumpet, but much of the first disc has a tentative feeling to it. Disc two is a different story. These sessions later appeared on the albums Collector's Items and Bags' Groove capture Miles and Sonny really digging into the music. The first session includes Charlie Parker (credited as Charlie Chan originally, due to contractual obligations) on second tenor sax, giving Rollins a run for his money. The next includes Horace Silver, Percy Heath and Kenny Clarke, as well as the debuts of several tunes that have gone on to become stalwarts of jam sessions - and recording sessions - everywhere: "Airegin," "Oleo" and "Doxy," all written by Rollins. Supposedly Sonny just whipped these out for the session, and whether or not that's true, the players respond with the enthusiasm of a group digging into a tune for the first time knowing they're onto something big. The final session includes a Brubeck tune Miles would redo soon after with Coltrane, oddly enough at the same session where the tune caled "Vierd Blues" would be rechristened "Coltrane's Blues." Ira Gitler provides liner notes that recount the history of these players' affiliation, along with some personal recollections from the sessions. (Gitler wrote liner notes and occasionally acted as something of a producer for Prestige.) The best story comes from the Parker session where Bird was the first to show up for the recording (a rarity, if not a first) and chugged the bottle of gin and Miles nearly walked out after Gitler came down to hard on him. If you don't already have the two albums on disc two, you ought to go out and by the whole thing. Yes, a very ECM-sounding ECM album. I have only a little bit of saxophonist Surman so when it was offered as a review item, I thought, why not. At the start of the summer I got an email about a national tour by a few psych bands, with the connection being that they all got their big start in 1966. Indeed - these weren't third or fourth generation bands but the progenitors, if you don't mind the $9 college word. The tour consisted of the Electric Prunes, Sky Saxon and Love "featuring Johnny Echols" (in other words original Love guitarist Echols along with the band that backed Arthur Lee in his last days, Baby Lemonade). Then Sky died about a month ago. I kept wondering if the tour was still happening but never actively combed through my email to find the publicist's name to ask and find out. Then on Sunday night, I came across an email dated August 3 that said the tour now included Jerry Miller from Moby Grape, taking the spot vacated by Mr. Saxon. My heart skipped a beat. I love Moby Grape, and immediately set about trying to make plans to make it to the show and get a chance to review it. Well, if it sounds to good to be true it probably is. Or let's put it this way: If you haven't heard anything about a show beyond two emails, it's probably cancelled. Monday afternoon, as I walked into the Three Bears' house at Storybook Forest with Jennie and Donovan, my phone rang. It was a guy involved with the tour who said the Pittsburgh show was cancelled because the venue did bupkis to publicize it. Somehow I knew that was going to happen. I guess I won't be touching the sleeve of a Moby Grape member any time soon. I'm going to the 30th Annual Detroit International Jazz Festival on Labor Day weekend! This is the first time I've covered something outside of Pittsburgh for JazzTimes. And the first time I've been to any big jazz festivals. The list of performers includes Wayne Shorter, Chick Corea, Hank Jones and our hometown hero Sean Jones. It's almost a shame that Mission of Burma is coming to town while I'll be up therein Detroit. I've only waited, oh, 29 years to see them in Pittsburgh. And they're playing Club Cafe, which ought to be an unusual venue since they're so freaking loud and liable to shatter the windows that are right behind the stage. In case I never said it here, I was listening to Mission of Burma when I decided that I wanted to seriously try to start a band playing bass. 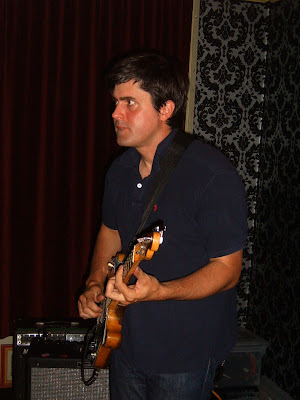 During the summer of 1985, I was obsessed with the Minutemen and Mission of Burma and noodled away on the bass hoping that something would happen than would put my fingers on the right frets and know what to play. That happened while listening to Burma's "This is Not a Photograph." It all fell into place and I wanted to be Clint Conley, via Mike Watt. It will be a shame to miss them but, then again, [copping a mock-haughty voice] I've already seen them twice since they got back together. I know they'll rock. So now, only two people who played with John Coltrane during his seminal quartet/quintet years are still alive: McCoy Tyner and Pharoah Sanders. A lot of people (non-free jazz fans, that is) might put Ali down because of his loose, wild style of playing, but the guy knew what he was doing. You talk about a flowing sound - that's what he did on the kit. I have two CDs he did as a leader, one with Leroy Jenkins and the other w/a quintet that included James Blood Ulmer. I'll have to get them out tonight. I'd really love to sit around all day, drinking iced coffee and listening to live Charlie Parker records. But I have a feeling this heat is going to be too much for me and I'm going to hightail it to an airconditioned coffee joint and try to weed through some promos. My brow is getting wet as I type. What's up with the Dirty Projectors? I started reading about the Dirty Projectors about a month ago when their Bitte Orca album came out. They seemed like the new critic's fave band: write-ups in Sunday New York Times, Rolling Stone (which I only caught because I got a free copy at work).... And somebody somewhere along the way started asking me about them. I can't remember who though, although I feel like it was someone from work. If it was you, speak up. So anyhow, I saw that Bitte Orca was available on vinyl, which made them even more appealing to me and someone I put on my mental music list. I wound up getting the CD anyway last Monday. (A few bucks less and I was able to walk out with two items instead of one.) I was writing reviews all week, so I didn't get to listen to it until last night. What's the story with these folks?! Don't get me wrong, I'm really into getting my senses challenged by new music these days. For instance, St. Vincent's latest is really intriguing for reasons that I still can't pinpoint. Plus it reminds me of Lida Husik a little (another Shimmy-Disc vet whose name I meant to drop in a previous entry). 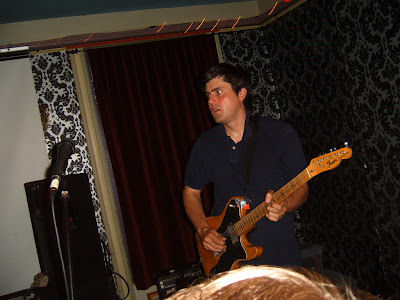 But these Projector peoples seem to have taken the math rock thing and fused it to a chamber pop aesthetic. (I guess it was only a matter of time.) My wife said some of it reminded her of Shellyan Orphan and I'll take it further and say that if you cross that band with the Fiery Furnaces, you'd be dead on. I'm a Furnaces follower and feel like there's always a pop song at the core of what they're doing. With the Dirty Projectors, I'm not sure. Sometimes it seems like they just slapped some off kilter twist onto a steady 4/4 type background to see how it works. I can appreciate that, but I'm not sure how often I'll reach for that CD. But I'm not ready to pass judgement yet. I need at least one more listen. 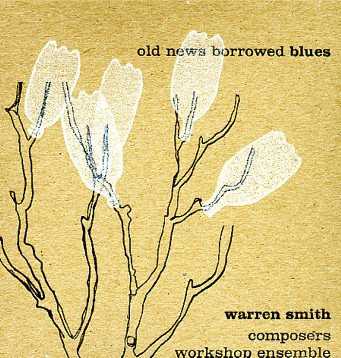 Drummer/percussionist/composer Warren Smith brought together 14 musicians plus himself to record these five brilliant pieces. Five saxes, four brass, guitar, African percussion and two drummers sound like the next generation of the Sun Ra Arkestra, although their influences stick with the various inhabitants of Planet Earth, rather than pulling more inspiration from the cosmos. "Rivers State Suite" consists of a three-part tone poem inspired by villages Smith visited in Nigeria and the songs griots sang there about their cities. Vibes set up a dreamy mood over reggae groove in the first part before the lower horns come in with a folk-like melody. The laid-back feeling shifts into a more urgent tempo for part two, where the harmonies go to church. The third movement is built on an equally simplistic riff, but the way the percussion kicks it along and the way Smith layers the horns keep it exciting. "The Hungarian Gypsy Song" also sounds true to its name, with haunting diminished chords, some gypsy guitar strumming and those dreamy vibes again. "Lock the Toilet Door" presents the group playing no nonsense hard bop, with a strong trumpet solo and a lot of fire from Smith and second drummer Lloyd Haber. "One More Like for Harold Vick," recently saluted by Sonny Rollins, pays tribute to the late tenor player with a theme that seems more like an emotional rendering than an attempt to emulate his style. Sounding a bit like a Mingus piece at times, it feels as if Smith is trying to explain the tragedy that Vick wasn't heard by more people. Smith explains in the notes that "Free Forms 1-4" comes from a set of ten interconnected compositions that utilize free improvisation. Each is marked by a sketch of a theme, followed by free blowing, that eventually cues in a vamp. The final section features Smith, presumably, reading a poem over a slow waltz with Craig Rivers' soprano and the vibes moving behind him, with the rest of the ensemble adding some dark chords and a few well-placed honks and blats. Jazz poetry can be a scary (read - bad) idea, but Smith avoids speaking in the cliched poet cadence and the text ("a love song, sort of") sketches a thoughtful image that feels appropriate after the frenzy that came before it. The only setback with Old News Borrowed Blues is that individual soloists aren't singled out. While the recycled chipboard cover includes notes from Smith on the music, it's not clear which drummer plays vibes (or if they take turns) or whether Cecil Bridgewater or John Carlton take the trumpet solos. Ultimately, that can be chalked up to nitpicking, though. With soloists that include Claire Daly (baritone sax) and Craig Rivers (soprano sax), and recent Art Ensemble of Chicago bassist Jeribu Shahid as part of the group, this is definitely one of the strongest releases of the year and needs to be heard.